JsignPdf is a free program whose purpose is to sign existing PDF documents, you can get this program from: http://jsignpdf.sourceforge.net. Open JSignPdf. Activate the "Advanced view"
2 - If your "digital certificate" doesn't appear on the list, and you just added it, click on the "Load keys"... most times thath is enough to make the digital certificates appear. If it still doesn't appears in the list you need to confirm that your private key is in the Windows Certificate Store on the "WINDOWS-MY" mode... there are other modes that may be more appropriate to your situation. 3 - Click here to add the FreeTSA server information (explained in the picture bellow). 4 - Select the best algorithm present "SHA512"
5 - If you want to present the information that the document has been digitally signed in the page itself. 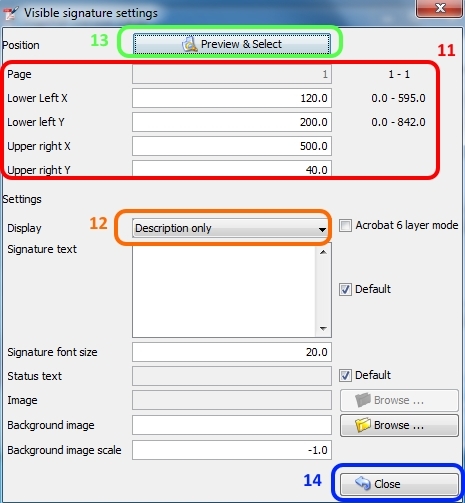 Select this option and see the "Settings" to customize to the document to be signed, so that it doesn't interfere with the look of the document. 6 - If you are happy with all the options and have already selected the file to sign in the "Input PDF file" you can click here to sign the PDF document. If you clicked on "TSA/OCSP/CRL" these windows should have opened. 7 - Select this option "Use timestamp server"
8 - Enter the URL: https://freetsa.org/tsr. 9 - In the hash algorithm field, if you leave it blank, SHA1 will be used; since since SHA1 is not advisable for digital signing, you can enter "SHA512" or "SHA-512" (both stand for the same algorithm). 10 - Click "OK" to apply the changes. This is a example of the content of a succesfully completed operation after clicking "Sign It" in step 6. This is the window you will see if you click "Settings" as shown in step 5. In order to be useful you should have already selected the file to be signed in the "input PDF file". 11 - Here you can fine tune the position where the signing information will be shown on the page. If you are not happy with the end result here is where you change the position and size of the area used by the visible signature. 12 - For a better looking document you may want to consider selecting "Description only", but is tottally up to you. 13 - This shows a preview of where the information will be presented on the page. You can fine tune the position in step 11. 14 - When everything is as you wish, click "Close" to return to the main window. JSignPdf has more features, which you that you may want to use, explore the program to understand all the functionalities.